Jahmia Harley, Gabriela Donahue, Regan Allen and Jada Chatoor combined after a hard day of swimming on Sunday evening to splash 4:36.43 in the 13-14 girls 400m medley relay – a new CARIFTA record. T & T shattered the old 2015 record of 4:38.34 which was set by Elisabeth Timmer, Anahi Schreuders, Keeley Maduro and Florence Kock of Team Aruba. Guadeloupe was second in 4:38.56 with Martinique taking bronze in 4:40.84. Bahamas topped the points table at the end of Day 2 with 406 points, with Guadeloupe in second with 347. Trinidad and Tobago (309), Cayman Islands (306.5) and Barbados (284) rounded off the top five teams. While Team TTO did slip one notch on the points table to 3rd, their dominance in the 50 metre butterfly events did not go unnoticed with 3 gold, 1 silver, 1 bronze, 2 national records and 9 personal bests, in the space of nine swims. Gabriela Donahue picked up her third individual gold in the 13-14 girls age group stopping the clock at 29.02 seconds, ahead of Guadeloupe’s Lucia Francois (29.17), with St. Lucia’s Katie Kyle taking the bronze (29.46). Donahue erased team captain Amira Pilgrim 13 – 14 National record of 29.41 of which was set on the CARIFTA stage in 2014. Jahmia Harley was 6th in 29.75. Donahue, together with her contribution to relays has amassed 27 points thus far, the most by any TTO female. Pilgrim two events later in her bronze medal swim did some record breaking of her own establishing a new 15-17 girls’ national record of 28.38. The old record belonged to Kristin Julien (28.56), and was set at the 2013 World Junior Championships. The 15-17 female 50 butterfly was won by Mika Heideyer of Martinique (28.12) with Elinah Phillip of British Virgin Islands taking silver (28.13). Racine Ross of T & T was 5th in 29.04. Kael Yorke followed up on his 100 fly victory to capture gold in the 15-17 50 fly in 25.23. In what has been the closest medal race for the competition so far, 0.02 seconds separated gold from bronze. Teammate Jeron Thompson captured silver in 25.24 while Steven Aimable of French Guiana copped bronze in 25.25. Yorke, together with his contribution to relays has amassed 18 points thus far, the most by any TTO male. Kadon Williams put down a magnificent swim to win the 11-12 male gold 50m butterfly swimming a personal best of 29.41 in the preliminaries, and further lowering his best time to 28.75 to take the gold. Silver was won by Corey Frederick-Westerborg of the Cayman Islands in 28.81, with Nigel Forbes of the Bahamas (28.83) taking bronze. 11-12 female Zoe Anthony (31.26) and 13-14 male Aqeel Joseph (27.20) were the other two 50 butterfly finalists and placed 5th and 6th respectively in their age groups. T & T had three finalists in the 100m backstroke events, with Jahmia Harley winning bronze in the 13-14 female edition in 1:09.65. Danielle Titus of Barbados won gold in a new CARIFTA record of 1:05.61 with Anouk Kamoise of Guadeloupe a distant second in 1:08.79. Ornella Walker placed 6th with a 1:09.13 in the 15-17 female race which was won by Lauren Hew of Cayman Islands. Zarek Wilson was also sixth in the 11-12 male race in 1:12.50, in a race won by Max Wilson of the Virgin Islands (1:08.63). Wilson was the first medallist for T & T on day 2 as he captured bronze in the 11-12 male 200m freestyle in a personal best 2:11.19. His team mate Blackman also achieved a best time of 2:13.34 but had to settle for 5th. The event was won by Frederick-Westerborg in 2:08.96 with Sam Williamson of Bermuda placing 2nd (2:09.21). Jada Chatoor also claimed bronze in the 13-14 female version in 2:12.59, a personal best for this 2017 CARIFTA double gold medallist. The event was won by Ali Jackson of Cayman Islands in 2:11.57, with Logan Watson-Brown of Bermuda taking silver (2:12.38). T & T’s medal fortunes in the 400m medley relays was limited to the record breaking 13-14 female team. A discrepancy on the backstroke to breaststroke handover earned T & T a disqualification in the 15-17 male race where the team had finished third. The 11-12 boys just missed out on a medal with a 4:44.72 4th place clocking just behind Bahamas in 4:44.46. The 13-14 boys and 15-17 girls placed sixth while 11-12 girls were 7th. Medals were elusive in the 400m Individual medley races for T& T with Chatoor having the best finish of 4th in the 13-14 female race (5:30.29). 11-12 girl Zoe Anthony (5:42.36) and 15 – 17 girl Sabrina David (5:37.38) placed 6th in their respective age groups in personal bests, with Nikoli Blackman placing 8th in the 11-12 male race (5:34.84) also in a best time. 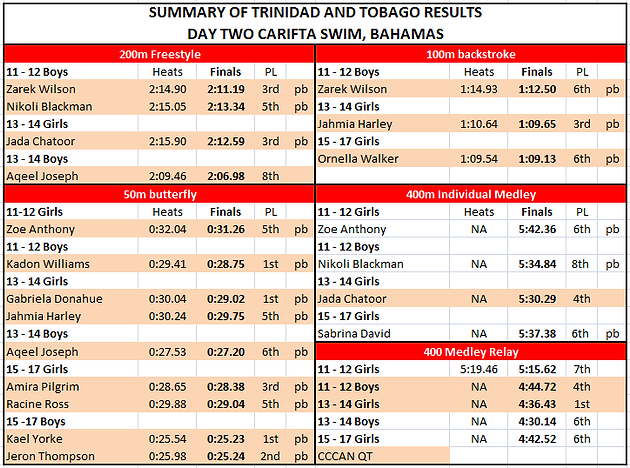 Day 3 of the CARIFTA Swimming Championships continues today with the 200m Individual Medley, 50m breaststroke, 100m freestyle, 200m butterfly, 11-12 male mixed 400m free relay and 13 & over 800m free relays. Some of the team start their return from early as tomorrow, with the last group returning on Friday.